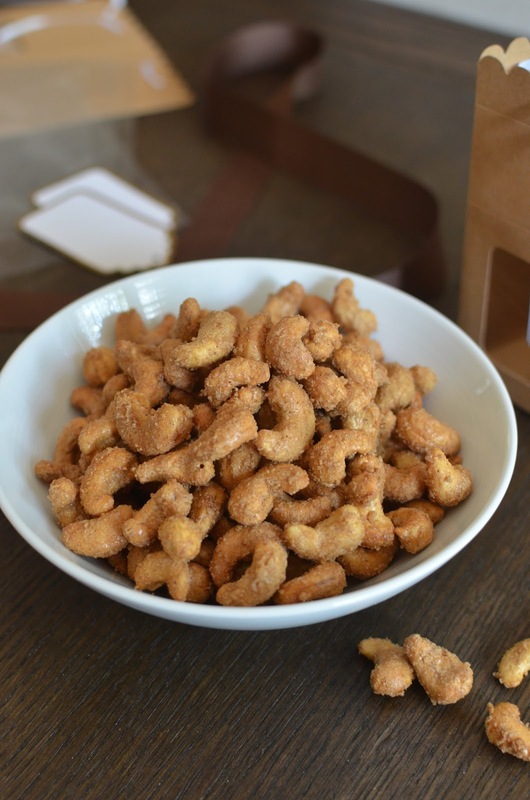 I adore cashews and I love making easy snack mixes that involve nuts - whether as a nibble for a party, to pack up and gift to friends, or just to have around as a snack. These vanilla cashew clusters I spotted from The Kitchn were too easy to resist. Did I mention I love cashews? I really do, and these simply involve a bag of cashews that you toss with an egg white, (brown and granulated) sugar, a touch of cinnamon, and vanilla extract to give them a fun sweet flavor with a little spice. Let the oven do the rest of the work, toasting the nuts and setting that sweet coating on top. I made these for friends and I'm hoping they like cashews as much as I do. I also brought some along to a gathering with my family; they're terrific with drinks. You can also enjoy them with yogurt for breakfast, as a topping for an ice cream sundae, or just pack up a bag and take them along on a road trip or as a snack on the go. In other words, there are plenty of ways to enjoy these and plenty of reasons to make a batch! There's been a pattern developing...what with cinnamon rolls, babka, yeasted coffee cakes, and the like, coming out of my kitchen lately. Making sweet rolls may not be the best habit to get into but I have to admit I find myself doing just that lately. Maybe I just need to get it out of my system? That's the rationale I'm going with for now. Since becoming smitten with homemade cinnamon rolls, I've been thinking about trying my hand at sticky buns. 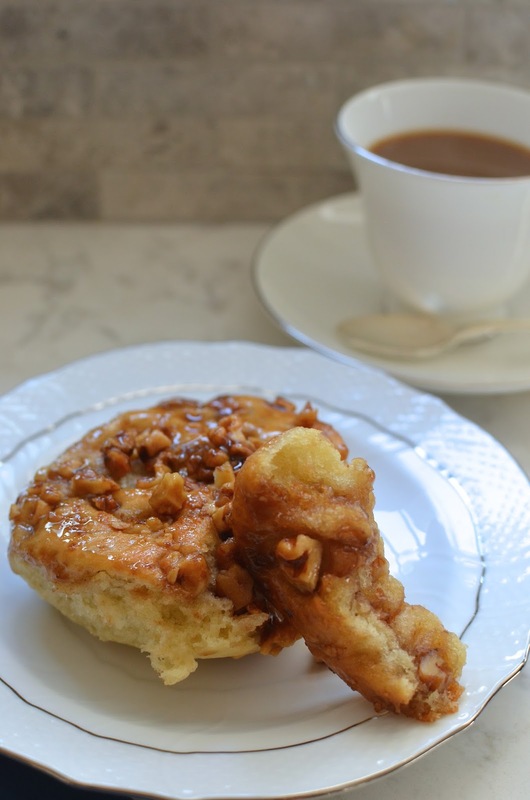 It's the "logical" next step because while cinnamon rolls are decadent, you up the ante with sticky buns, which are like cinnamon rolls with an added sticky sweet caramel topping. Once in a while, you just have to go for it. Like I said, I think I need to get it out of my system. My lone defense in all this sweet roll-making is that at least I've (mostly) been sticking with small-batch recipes. Here, I adapted the pecan sticky buns recipe from Dessert for Two, which makes 4 buns. I made a few tweaks to the recipe, including using walnuts instead of pecans because pecans are not a family favorite. Instead of baking the 4 sticky buns using a jumbo muffin pan (which I don't have but sometimes wish I did), I baked them in an 8-inch cake pan. Lastly, I reduced the amount of butter in the filling by half in an ongoing attempt to enjoy decadent treat in the least decadent way. Maybe it's silly and futile when we're making sweet treats like this but I can't help but try. Things were not looking good for my first attempt at stick buns. The dough, which didn't require kneading but I felt could have used some, was wetter than I expected so the buns were fragile to handle (that sounds funny, doesn't it). I was also concerned that I didn't have enough of the sugar mixture at the bottom of the pan (though that turned out not to be a major issue). But the worse offense I committed might have been not running a knife around the pan to loosen the buns around the edges before attempting the all-important flip. Because of that, I have no presentable photos of all 4 buns flipped over together showing off their sticky caramel tops. Suffice it to say a bit of each bun stuck to the pan. I thought we would just eat these sticky buns in all the messy stickiness and I'd forget about it for a while...but I took a bite, then some more, and realized I had to post it so I can sing their praises. They are so tasty! Why was I surprised? As with most things filled with butter and sugar, these sticky buns did not disappoint. And I might add that any leftovers are mighty tasty the next morning, with just a few seconds in the microwave to warm them up. All that sticky sweetness preserve them quite well! From the slightly hardened, almost-crunchy, caramelized edges to the moist chewy soft centers, these sweet rolls filled and topped with toasted walnuts are rather addictive! The way I look at it, instead of buying them outside, make them occasionally at home so you can indulge responsibly. They are a worthy occasional splurge! 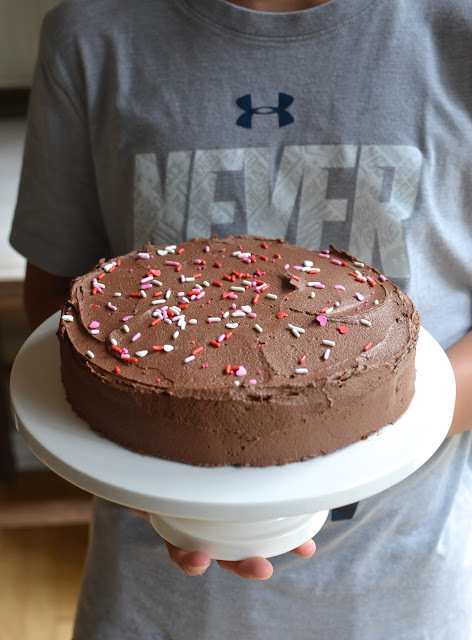 I find myself craving sweet comfort foods like these lately even in the midst of summer...not sure why it is but I'm getting it out of my system by enjoying my cravings in moderation. A small-batch recipe is the answer.